Life doesn’t come with a manual. We have beliefs and religions for sure, but there is always some little doubt in all of us. We don’t have all the answers, but we carry on. We try fit all our little pieces together to make it work and to make it “perfect” for us. Humans are amazing. We are sometimes born with or inherit disabilities, have abusive parents, relationships or friends, lose jobs, experience financial hardship and ruin, have lovers hurt us, divorce us, lose loved ones, suffer from disease and illness, become addicted to various substances, suffer from depression and anxiety and long for things to be right – because we believe we deserve it. Despite all these hardships, we carry on, just carry on doing our best, even sometimes when it is with anxiety, a heavy heart or in pain. We have faith in our beliefs, our religions, our Gods and in tomorrow. Because just like a jigsaw puzzle, we try to fit each piece together to get to the finished masterpiece. Sometimes though it is a little easier when struggling with a jigsaw puzzle, to just step away for a while. 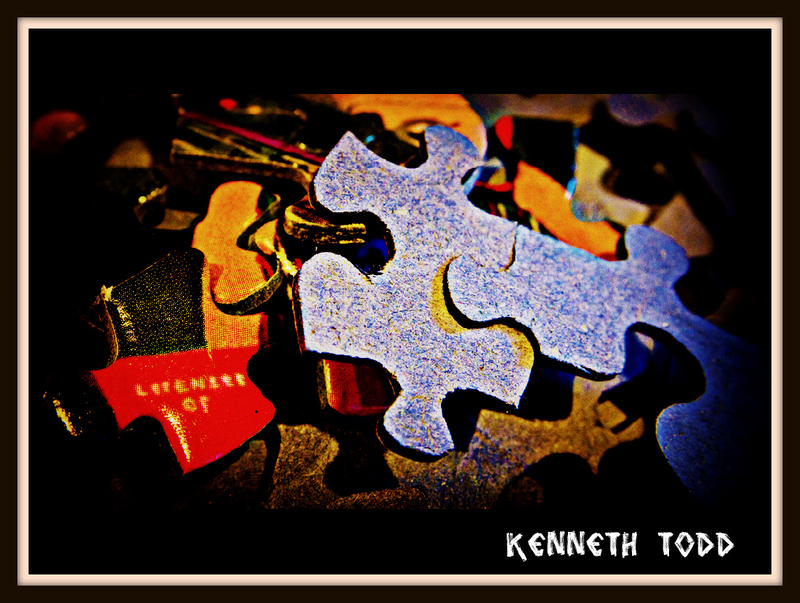 In most cases when we come back a little refreshed, we find that missing piece straight away and we progress quickly. Try that if anything you are “trying” to achieve seems beyond your grasp. Release for a while, stop trying so hard and see what happens. Also, a jigsaw is sometimes easier, when you lean over to a friend or partner and say. “Can you give me a hand here?” Rely on your friends and make sure they can rely on you too. Lao Tzu once said “A journey of a thousand miles must begin with a single step.” or in this case : “a single piece”. Great advice … and a great photo. Good words; a reminder that we need many times on the journey! So so so so true. And sometimes the piece slipped down the heating vent and we never find it, yet have a richer life experience as a result. Well said. I like how you are writing such thoughtful posts to go along with your photos. Inspiring. Thanks for visiting my blog tonight.